While our cats may not like to admit it, with their independent streak and all, they rely on us to make all the decisions regarding their diet. Here’s a handy guide on how to create a healthy diet for your cat. Since cats tend to eat the same food at almost every meal, it’s easy to understand just how important it is that you select a food that will completely meet your cat’s nutritional needs. Establishing a healthy diet plan will not only help your cat maintain a healthy bodyweight, it will improve his quality of life and even extend his lifespan. Selecting a high-quality cat food at the supermarket, pet store, or veterinarian’s office is the easiest and safest way to ensure that your cat gets the vitamins and nutrients he needs. When selecting a cat food, be sure to check for a statement from the Association of American Feed Control Officials (AAFCO) on the food’s packaging. Foods bearing this label have been confirmed as providing complete and balanced nutrition. For this reason, nutritional supplements aren’t necessary, or beneficial, unless recommended by your vet. High-quality fats and proteins are the building blocks of a healthy feline diet. 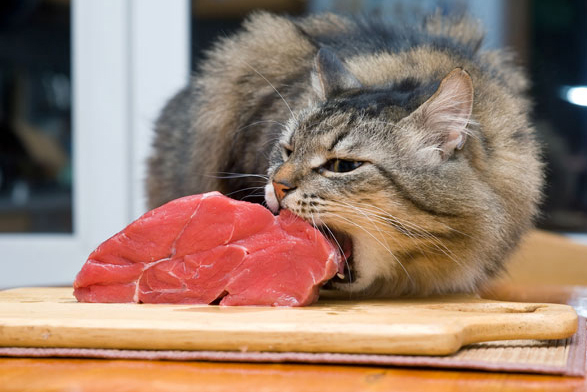 Unlike humans, cats can not go vegetarian. They require a carnivore’s diet that supplies enough taurine (an amino acid) and other meat-specific nutrients. For this reason, they shouldn’t be fed dog food or people food, because it doesn’t contain enough nutrients to meet your cat’s nutritional requirements. Fresh, clean water should also be available at all times. A number of the foods available through your local retailer are designed for cats with specific dietary needs. Kittens, for example, need more calories, protein, fats, etc., so all kittens under nine months of age need a food specifically formulated to fit their needs. Pregnant and nursing cats also have elevated nutritional needs. If your cat has become pregnant, ask your vet about her changing needs. In addition to foods targeted towards different stages of a cat’s life, prescription foods, available through your vet, can address health concerns such as: kidney disease, obesity, or urinary tract disorders. Ask your vet about creating a diet plan to address your cat’s specific requirements. One thing to consider is going for dry food to boost dental health. While the soft, meaty flavor of canned food is hard for cats to resist, dry food is actually better for their teeth and gums. Ask your vet for advice around cat food and dental health. While it doesn’t have to include candlelight and mood music, cats too prefer a relaxing dining environment. Place your cat’s bowl in a quiet area of the house, away from the hustle and bustle. Here are a few suggestions that may help smooth out any creases in your cat’s feeding routine. Divide and conquer. If you have a multi-cat household and not all of your felines are on speaking terms, multiple feeding locations may ease some of the tension. Try variety. If you cat is a picky eater, try a variety of high-quality foods until you find one he likes. Then try to stick with it. Practice “free feeding.” As long as your cat isn’t an overeater, you can leave dry food out at all times, allowing him to feed freely. But if weight is an issue, be sure to discuss this option with your vet. If free feeding is not an option for your cat, make a feeding schedule. Most adult cats should be fed at least twice a day. Open a new can. Canned food isn’t recommended for free feeding, because it may dry out, spoil, and become unappealing to your cat. Try opening a new can before your can of food has congealed into a hockey puck. Don’t overfeeed. Obesity is anything but a superficial concern when it comes to your cat. Overfeeding can lead to a rash of diseases including obesity, arthritis, and heat disease — all of which can greatly reduce your cat’s lifespan. Consult your vet for advice about keeping your cat at his ideal bodyweight. Watch for Appetite Loss. If you notice your cat’s appetite mysteriously flagging or completely disappearing for an entire day, call to make an appointment with your vet. The lack of an appetite can be a sign of serious illness. Milk. Milk can give cats diarrhea, since they become lactose intolerant after the weaning process. Table Scraps. Table scraps can upset your cat’s stomach and nutritional balance so as tempting as it can be, only give your cat vet approved foods. Other problem foods include: Chocolate, Grapes, Raisins, Coffee, Caffeine, Alcohol, Salt, Onions, Garlic, or Chives.